Breyer Horse Events: Breyerfest British Invasion! In less than three weeks the largest Breyer event in the world will come to the Kentucky Horse Park, Breyerfest! Each year thousands of collectors come from all around the world to Kentucky to celebrate their love for model horses, this year they’ll do so with a fittingly British theme! This year Breyer has chosen to celebrate all things British at Breyerfest, and it’s no question why! From the Queen’s Diamond Jubilee to the summer Olympics, Great Britain is having a very busy year! Breyer has chosen to bring that same spirit to Kentucky for 2012. From a celebration horse that is worthy of the Queen’s stables to a presenter straight from the United Kingdom, there’s no stopping the fun that’s on it’s way from across the pond! July 20,21 and 22 are sure to be three days packed with fun for everyone. There’s seminars to teach you everything from the basics of collecting to equine genetics! There are also workshops that give you a hands on experience on sculpting, customizing, prop making and even videography! That’s certainly not all though, there’s three contests, each with a British theme that you can try your hand at to win a special prize. 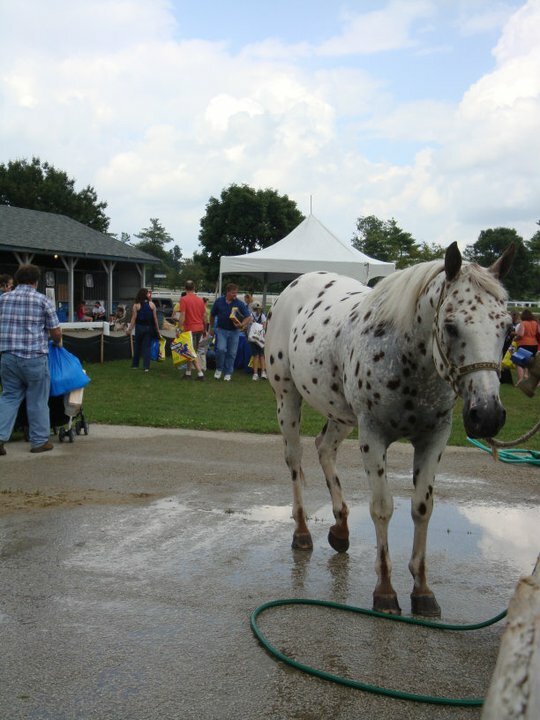 The iconic horse shows will be there in full force this year as well for both Open and Children/Youth showers. There’s raffles, special guest horses and performances all weekend too! Saturday night will wrap up with a concert from BritBeat, a Beatles tribute band that will surely put everyone in the right spirit! This year also marks a year when the North American Nationals will be in Kentucky, so if you happen to be in Kentucky a few days before Breyerfest, be sure to pop over to the famous Rupp Arena and see all the fierce competition! If you can’t make it to Kentucky this July don’t fret, Golden Oak Stables will bring you all the coverage! Stable News is your direct connection to Kentucky this July, so sit tight and tune in! You won’t want to miss a thing! A stunning little breed with a ton of power, the Hackney Pony is a breed all it’s own! Now Golden Oak Stables brings you a new Breyer for mid year 2012 that epitomizes the spirit of this breed into a model representing one of the most accomplished Hackney ponies around, Heartland High Tech! Originally from Great Britain, the Hackney Pony was originally created by breeding Hackney Horses with Fell Ponies. What was created was a powerhouse pony capable of not only pulling carriages, but doing so in style! These ponies were originally called Wilson ponies after their creator Christopher Wilson but soon became known as the Hackney Pony we know today! There are many types of Hackney Ponies, from Road Ponies to Pleasure Ponies these ponies excel under the saddle and behind the cart! Hackney Ponies compete in the United States at the same shows as Saddlebred and Standardbred horses, although in different classes. One of the most accomplished Hackney Ponies in current competition is Heartland High Tech. This little 10 year old powerhouse has found himself to the winners circle more times than he could count! From winning Hackney Pony of the year in 2010 to bringing home the World Championship win in 2012, Heartland High Tech is truly a pony for the record books! Breyer has created Heartland High Tech on it’s ever loved Hackney mold. With his parked out stance, braided mane and bobbed tail, Heartland High Tech shines in Breyer form just as he does in the show ring. His deep bay color has shading along his flanks and in a few other areas the light touches! A pair of short white sock sit on his back feet giving him the perfect contrast to his strikingly dark coat. His confident expression leaves him ready for the show ring and with his perfectly groomed looks there’s no stopping him! Another world champion that’s ready for the record books, Heartland High Tech joins the ranks of Breyer champions with his very own model. Now you can add this rare and striking breed to your stable! One of the longest running and most watched television series of all time, Bonanza has captured the spirit of the wild west! For nearly 14 years the story of the Cartwrights and their adventures on their Nevada ranch. Breyer has immortalized the unsung heroes of the show, the horses, with a model of the main character’s mounts. Now Sport gallops into the Breyer stable with a model of his very own! Sport was the beloved mount of the eldest Cartwright son, Adam. The most educated of his three brothers, Adam attended school for engineering and architecture and went on to build the family’s ranch house! Being the oldest he often took on the responsibilities of the family and the ranch and was thought of as the most well thought out of his three brothers. His faithful mount Sport was a chestnut gelding that carried Adam through the wilderness time and time again. This part Thoroughbred gelding was beautiful as he was strong. Now, Breyer has created a Sport of their own, the fourth in the Bonanza series bringing this amazing horse to collectors everywhere! Created on the San Domingo mold, Sport is a bright red chestnut gelding that is sure to catch the eye of any ranch hand or horse lover alike! Shining with his bright coat color, Sport stands out even more with high white socks on each of his legs. On his face he also has a big white blaze that stretches all the way down. The San Domingo mold is known for it’s calm demeanor and calm nature, perfect for any ranch work. Sport epitomizes the spirit of a ranch horse rolled into one little horse shaped model. Bringing the fun of the wild west along with one of America’s favorite television shows, Golden Oak Stables brings you the fourth horse in Breyer’s Bonanza series. Bring a bit of classic television along with the wild west to your stable with Sport. Excitement is sure to follow! One of the most mystical things about showing model horses are the judges. How do they do it? Why are they judging? Who are they? Judges and judging may seem foreign to many, but there’s a reason behind it all. Judges for the most part are just regular hobbyists like anyone else. Most of the time they have been in the hobby for a little while and have live shown for a while as well. Experience is key for judging. Many live show judges also have an extensive real horse knowledge. With both hands one experience as well as experience in the hobby, model horse judges have knowledge that can easily transfer to a model horse show. Another common question about model horse shows is, how does the judge pick a winner? For every judge it is different, but for most the same basic criteria is used. In breed judging conformation and breed standards are of most importance. Judges strive to choose a horse that looks nearly exact to what it’s real life counterpart would look like. Things like sculpting styles and pattern markings can leave a little room for interpretation in the judges eyes though. Personal preference always plays a small part, but a good judge will only use that criteria when it’s absolutely necessary. For performance a judge has to look at every detail to see how close the scene has been recreated! Things like safety, tack position and realism are all of high importance with performance. Performance judges are often experts in their field from real, hands on, knowledge of the sport. This makes the hobby all the more competitive! For the most part, judges are just normal hobbyists looking to share their knowledge and help. Without them there wouldn’t be any live shows! Often sacrificing showing their own horses, Judges are the unsung heroes of the model horse world. The next time you’re at a Golden Oak Stables live show, don’t be afraid to ask the judges if you have a question. Sharing knowledge is a one of the most wonderful things and learning more about real horses and model horses is a wonderful way to experience the hobby! Without the wealth of knowledge that our judges bring, we’d certainly not have the hobby we know today! Sadly fans of horse racing learned last Friday that 2012 wouldn’t be the year the Triple Crown was won again. Millions had hoped that a little chestnut colt named I’ll Have Another would have one more race in him and bring home the Triple Crown after 30 years. The Triple Crown is the pinnacle of horse racing, combining three of the most difficult races for three year old race horses into a grueling span of just over a month. From Kentucky to Maryland to New York the best three year olds in the world compete to see if they can place their name in the record books along with the other greats in horse racing. With three tracks, in three different parts of the world and with three different lengths of the track, this task is far from easy. The longest track is the Belmont, the final leg of the Triple Crown. With a race length of just around a mile and a half, this is truly the test of a true champion! Many have come close, but none since Affirmed in 1978 have accomplished it. This year, it was clear early on that I’ll Have Another had Triple Crown potential. With his impressive run in the Kentucky Derby and an even more impressive run in the Preakness, I’ll Have Another was gaining fans by the second. Sadly the day before the Belmont news came out that I’ll Have Another had an injury that would prevent him from running and caused him to retire. Belmont Park celebrated his accomplishments on the day of the Belmont in a retirement ceremony where the fans could all congratulate how close he came to making history! We may have to wait another year for a chance at the Triple Crown, but Golden Oak Stables has a little piece of racing history you can bring home yourself. With one of the most impressive Triple Crown wins of all time, Secretariat is probably one of the most famous race horses ever. With an unmistakable 31 length win Secretariat truly was a horse for the history books. Horse racing fans will have to wait another year for a shot, but it’s needless to say that this year certainly was a memorable one! We may not have a Triple Crown winner for 2012 but the memories of I’ll Have Another are ones no one will soon forget! Some of the most exciting new models for 2012 are a line of exciting resins that celebrate the breeds of the world! Breyer surprised us with four of these new exciting horses in early 2012 but no one was expecting three more to show their face for the summer! Now you can add three more to that lineup with these new exciting models that are galloping their way into Golden Oak Stables. First up is a Clydesdale that commands attention with his presence. Draft horses are the powerhouses of the equestrian world with their large size and power. Originally bred to work in the farm fields and pull the family wagon into town draft horses are the overall work horse. Draft horses are also known for their kind personalities, often being called the “Gentile Giants”. Breyer’s newest addition to the Breeds Of The World series a bay sabino Clydesdale that looks like so many of the Clydesdales we all know and love! He even has patriotic red, white and blue ribbons in his perfectly groomed mane. From the western United States a breed all it’s own charges in with spirit and history! Originally brought by the Spanish conquistadors, the American Mustang is a breed that captivates the imagination of many with its free spirit and beauty. These horses live throughout the western United States in herds and each year some are rounded up by the Bureau of Land Management and are adopted into new homes. These horses are amazing athletes and have attained unimaginable success! The Breeds Of The World Mustang is captured in high action and is painted in a stunning grullo pattern that is striking to say the least! Last but certainly not least, Dressage champion Totilas has been added to the Breeds Of The World collection! This 12 year old Dutch Warmblood is the first horse ever to score above a 90 in dressage and it’s no question with scores like that why he’s taken the world over! Totilas has won many awards including big wins at the World Equestrian Games in 2010. He is certainly, the horse that could! No matter what kind of horses you love, there’s a Breed Of The World horse that will tickle your fancy. From strong but gentile draft horses, to a wild Mustang all the way to a Dressage world champion, the variety is wide. The hard choice will be where to start! Galloping into Golden Oak Stables and into the Breyer lineup for mid-year 2012 is an exciting array of horses that are exciting to say the least! One of those horses is Lil’ Ricky Rocker! This stunning leopard Appaloosa is not only beautiful but already a celebrity with Breyer collectors! Many Breyer collectors that have visited Breyerfest will remember the gorgeous Appaloosa that finds his way there! From being Breyer’s Stephanie Macejko’s mount in the opening ceremonies to spending time with visitors Lil’ Ricky Rocker gets everyone’s attention wherever he finds himself! Lil’ Ricky Rocker’s stunning coat! 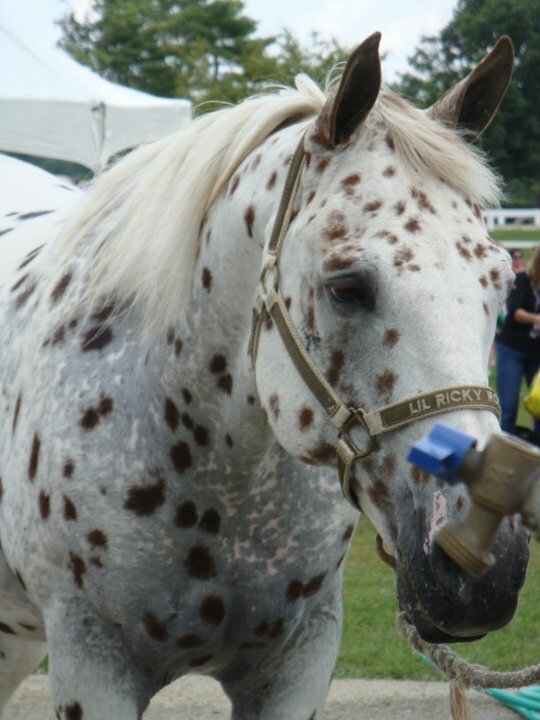 Lil’ Ricky Rocker isn’t just a Breyerfest celebrity though, he’s also a champion Appaloosa gelding! Foaled in 1992, Lil’ Ricky started his show career at age 3. It wasn’t long before Lil’ Ricky faced a road block that would threaten to take his life, colic. He was able to pull through and went on to a very successful show career winning championships not only in Junior Reining but also earning several National and World Grand Championships! Making his debut now as a Breyer Lil’ Ricky Rocker’s striking leopard coat has been reproduced down to the spot! Leopard Appaloosas are known for their distinctive full body spotted pattern. 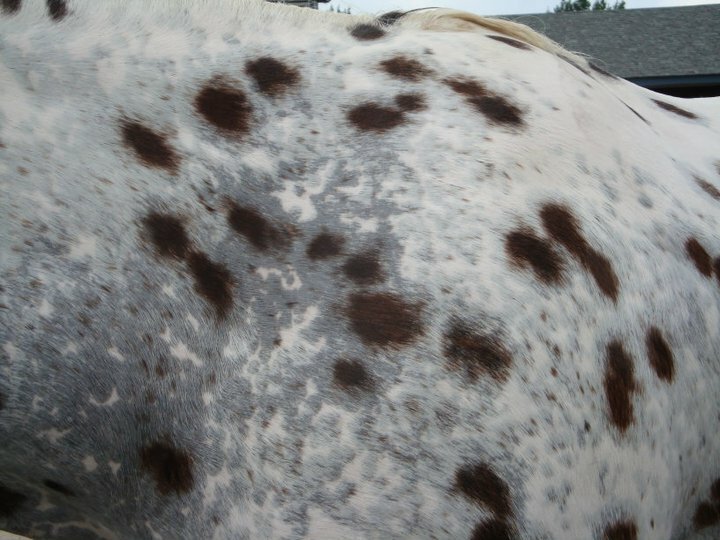 One of many different Appaloosa coat patterns, this is one of the most eye catching. Lil’ Ricky’s spots are a gorgeous shade of bay and sit all over his body in the most interesting of patterns. Lil’ Ricky Rocker has been created on the Zippo Pine Bar mold, the portrait of another very famous stock horse. Shown in a slow and steady walk, Lil’ Ricky Rocker is the perfect calm mount for any rider. Mix that with his fun and flashy coat and you’re sure to get a winner! Lil’ Ricky Rocker may already be known and loved by many Breyer lovers, but now everyone can have a little bit of him with his portrait model! The striking good looks and stunning nature of this wonderful Appaloosa is enough to turn heads wherever you might see him! You are currently browsing the Stable News blog archives for June, 2012.